My brother-in-law, Tom wanted to take a hundred photographs of the buildings in Melbourne’s docklands and riverfront, so earlier this year I went along with him for the early morning walk. We got out at Southern Cross Station, the former Spencer Street Station and crossed the tracks out of the old city. 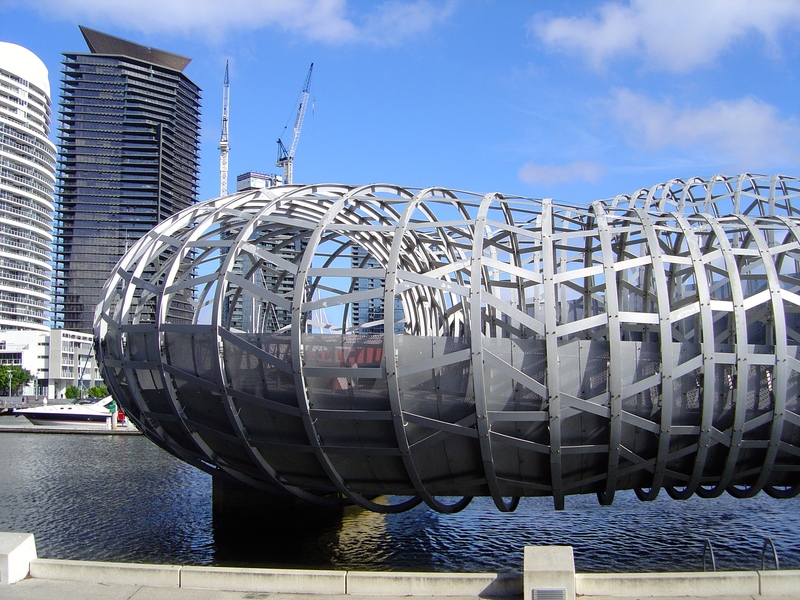 This is not walking Docklands’ public “Art Journey” as Bronwen Colman, the urban art director of the Melbourne Docklands precinct planned but a psychogeographical meandering along the Yarra River. The Yarra River is the reason for Melbourne’s location, it was the transportation hub for the new settlement and it became an industrial site. When the modes of transportation changed in the late 20th Century the river became a neglected site. Another use had to be found for this polluted waterway and like many cities around the world Melbourne turned it into a parkland, river walk, casino, aquarium, restaurants and arts centre. 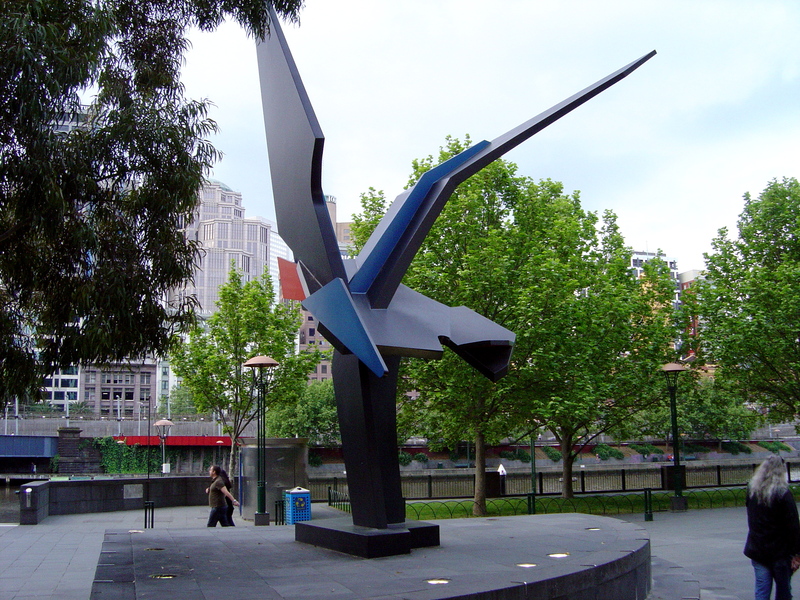 The Yarra River started to be redeveloped in the 1970s with the construction of the Victoria Arts Centre and this urban redesign required more public sculpture. While Tom was photographing the architecture I was looking at and occasionally photographing the sculptures. 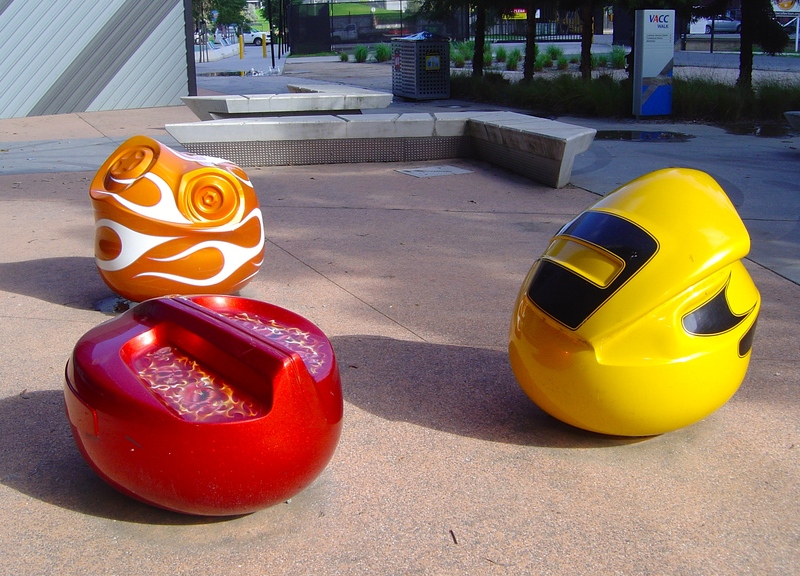 Just off Batman Hill Drive at the Kangan Institute of TAFE’s Automotive Centre of Excellence I spotted three seats by Patricia Piccinini, the Car Nuggets, 2006. The chrysalis forms of cars or motorcycles about to metamorphose is both typical of Piccinini’s oeuvre and appropriate for the location. 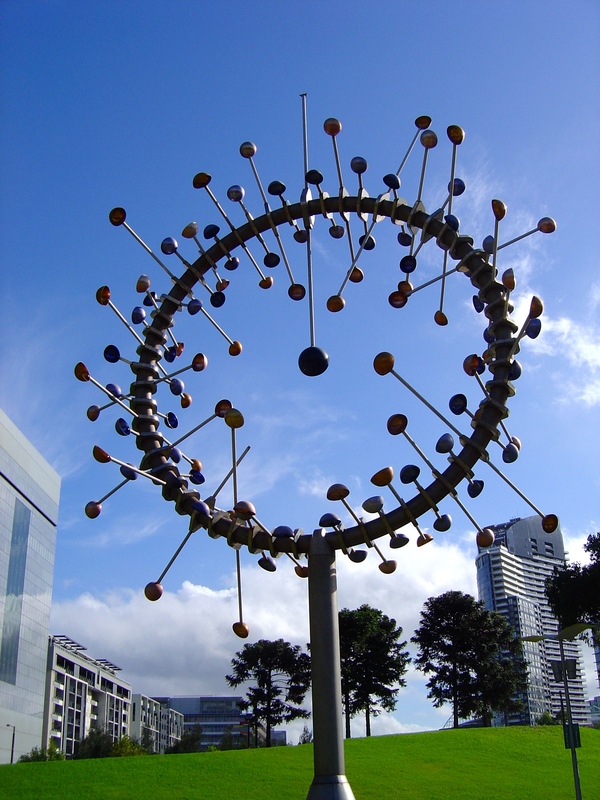 We could hardly miss seeing Sydney-based artist, Duncan Stemler’s Blowhole, 2005; a 15 metre tall kinetic wind-responsive stainless-steel and aluminium sculpture located in Docklands Park. In 2008 two of the anodised aluminium cups were blown off but there wasn’t much wind and it wasn’t doing much when we were there. The area feels deserted until we crossed the river at the Webb Bridge and then things were there was the noise of a flock of parrots enjoying the palm trees. Tom didn’t mind the lack of people, he was happily photographing the architecture of all the new buildings. As we progress up the south bank of the Yarra there are a few more people were around. I remember reading stories about the early days of Melbourne where people disembarking from ships at the port kept walking up river for what to them seemed like ages until they saw the city. It is very similar today or maybe the city was finally waking up on the weekend. Further reminding me of the early days of Melbourne the area has these touches of hyper-reality in the old pump house with boilers made by the old Robinson Bros. foundry. I recognised the name of the foundry as they had made Percival Ball’s Francis Ormond Memorial at RMIT. 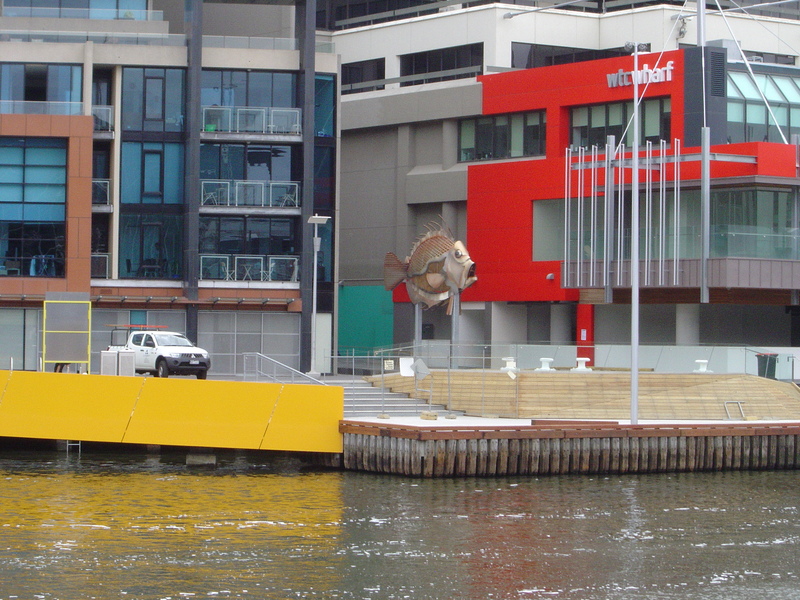 On the north bank of the Yarra River poking its head out from amongst the apartments is a giant metal John Dory fish. It was originally on a floating platoon during the 2006 Commonwealth games and was constructed by a company called Megafun. Megafun also provided technical and project management support to Scar – A Stolen Vision in 2001, the aboriginal poles further along the north bank. The crowds started to build up around the exhibition building and the casino. We had to find some shade so that Tom could see his camera’s screen properly; he was up to his 81st photo. 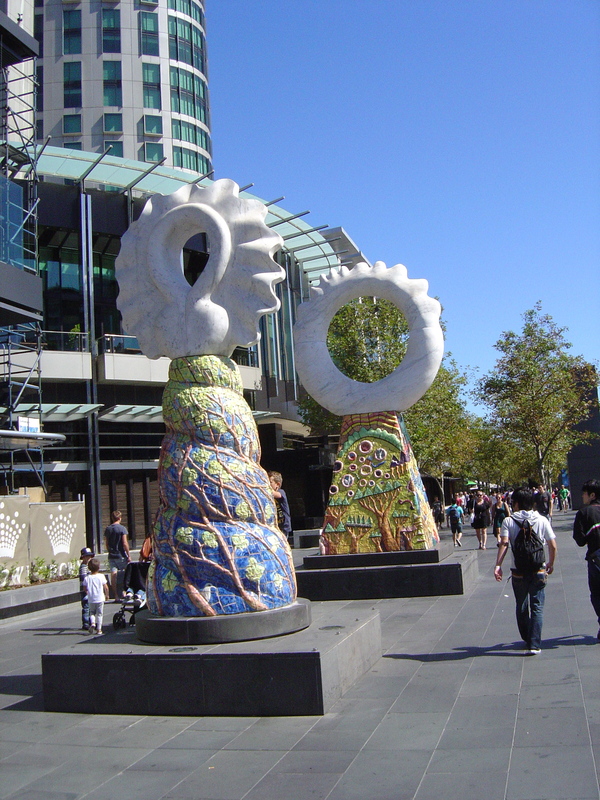 Outside the eastern end of Crown Entertainment Complex are The Guardians by Simon Rigg. These two large sculptures carved from Italian statuary marble and clad with ceramic tiles. Rigg has a number of other marble public sculptures around Melbourne, including Babylon, 1995 is at 101 Collins Street, as well as, in Beijing and New York. We come to Inge King Sheerwater, 1994 in front of the Esso building. (See my post on Inge King.) Tom puts his camera away, he has taken his hundredth photo and we cross the Yarra heading up Swanston Walk to Chinatown for a well earned yum cha.